This foreign Amrutanjan sign measures 9″ by 18″. 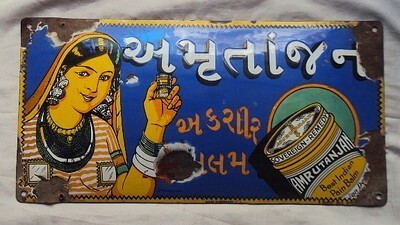 The sign shows an Indian Woman holding balm in her left hand while wearing traditional Indian wear. To the right of the sign is a small bottle of the balm that is being advertised. To the normal English speaker, the text is untranslatable.